German-American physicist who developed the special and general theories of relativity. He was awarded the 1921 Nobel Prize for Physics for his explanation of the photoelectric effect. The lines above were used as an epigraph—an apposite quotation at the beginning of a work—in the book Albert Einstein: Creator and Rebel (1972) written by Banesh Hoffmann and Helen Dukas. Hoffmann, a physicist, mathematician and author, was a colleague of Albert Einstein. In writing this biography, he collaborated with Helen Dukas, who was Einstein's secretary for many years. Thus, these two people personally knew Einstein well, so we may be assured the opening quote in their book is a faithful record of Einstein's remark. Later occurrences of these words in quote collections and other books, cite this biography as its source. 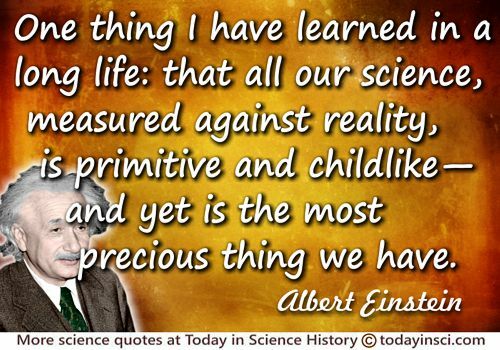 Science Quotes by Albert Einstein. 14 Mar - short biography, births, deaths and events on date of Einstein's birth. Albert Einstein - My Theory - The Times (1919). Geometry and Experience - Address by Albert Einstein to the Prussian Academy of Sciences (27 Jan 1921). Even Einstein's Little Universe Is Big Enough - New York Times article (2 Feb 1921). Large color picture of Albert Einstein (850 x 1000 px). Albert Einstein - Context of “Laws of mathematics refer to reality” quote - with Large image (800 x 600 px).